Referring to “Tumour,” “Node,” and “Metastasis,” the TNM system is the most widely used means for classifying and staging the extent of cancer spread. Published in affiliation with the Union for International Cancer Control (UICC), TNM Atlas, Sixth Edition presents the illustrated version of the TNM Classification of Malignant Tumours, Seventh Edition, promoting the uniform application of the TNM classification in cancer practice. Utilizing beautiful, full-colour medical artwork—illustrating the T and N categories in clear, easily understood graphics—this book aides in the practical application of the TNM classification system. It enables all disciplines involved in cancer classification, staging, and treatment to reach a more standardized understanding and documentation of the anatomical spread of tumours, and further enhances the dissemination and use of the TNM classification. Based in Geneva, the UICC is one of the most widely affiliated cancer organisations in the world, with its core mission being cancer classification and control. 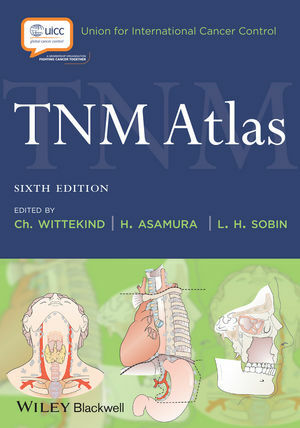 Its TNM Atlas, Sixth Edition is a valuable reference for all medical, surgical, and radiation oncologists, anatomical and surgical pathologists, cancer registrars, oncology nurses and physician extenders, international cancer care centres, and governmental and NGOs dedicated to cancer control. This title is also available as a mobile App from MedHand Mobile Libraries. Buy it now from Google Play. Christian Wittekind, MD, is Professor of Medicine at the Institute for Pathology at the University of Leipzig, Germany. For this book, Dr. Wittekind represents a large international panel of oncology and oncologic pathology experts who contribute regularly to each new edition of the TNM Classification of Malignant Tumours, the book on which the TNM Atlas is based.